Here are some adjectives in Thai with their English meaning that will help you when describing things. If you want to emphasize that quality or that there was a lot of it, simply add “mak” to the end of the word. Example, “suay mak” means very beautiful. You can also make a comparison to another object by adding “mahk gwah,” which mean more than, or “noi gwah,” which means less than. Example, “suay mak gwah” means more beautiful than __________. If you don’t add another object to compare to, it means more beautiful than before. To fire one shot and get two birds. Meaning – To kill 2 birds with one stone. Dive for a needle in the ocean. Meaning – Look for a needle in a haystack. Meaning– You can’t make an omlette without breaking eggs. Meaning – Make hay while the sun shines. Dying to spite the graveyard. Meaning – Cutting off your nose to spite your face. One rotten fish makes the whole catch smell. Meaning – A rotten apple spoils the whole barrel. Bad seven times, good seven times. Meaning – Every cloud has a silver lining. Crying like a turtle being grilled. Meaning – Crying your eyes out. Don’t catch fish with both hands. Meaning – You can’t have your cake and eat it too. To know things in the same way a duck does. Meaning – Jack of all trades, master of none. These are a few Thai proverbs along with the approximate English pronunciation. A literal translation of the proverb is also given with the English equivalent or meaning. Many of the ideas expressed in these sayings is also found in English and reveals some of the similarities between cultures around the world. Meaning – Out of the frying pan and into the fire. To play the violin for the water buffalo to listen to. Meaning – Cast pearls before swine. Don’t worry yourself about the fever before it arrives. Meaning– Cross the bridge when you come to it. Meaning – When the cat’s away, the mice will play. Catching somebody with the hide and the horns. Meaning – Catching somebody red-handed. When you are travelling around Thailand, a few phrases that express your basic needs will go along way to getting the things you want like food and water. In addition, question words are useful when you are purchasing things, getting directions or just having a conversation with someone. Of course, pantomimes and gestures added with your attempts to speak Thai will help others to understand you quicker. Other than a few basic Thai phrases, here are a few words and phrases that will help you seem like a polite farang to Thai locals. There are a few pronouns and basic greetings to add to your vocabulary as well. * The asterisk indicates that you can add “kaa” if you are a female or “krup” if you are a male to the ending. This makes the phrases even more polite and respectful. The tuk-tuk is a quirky form of public transportation that you can find in Thailand. Tuk-tuks are the Southeast Asian version of a vehicle also known as an auto rickshaw or cabin cycle. It is widely used in urban areas like Bangkok and other Thai cities as they can maneuver on crowded streets and zig-zag around cars. Other major Southeast Asian and South Asian cities also have variations of tuk-tuks on their roads. Tuk-tuks resemble a three-wheeled motorcycle or tricycle. 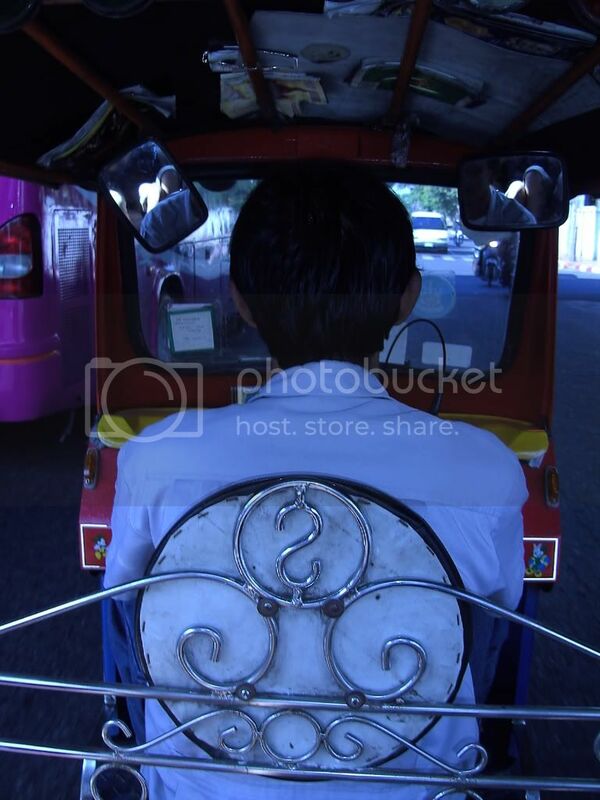 Tuk-tuks are named from the sound that their two-stroke engines make when they idle. They have handlebar controls like a motorcycle instead of a steering wheel. They usually have a sheet metal body or open frame with a canvas roof. Many times they have ornate hammerings or carvings for decoration. The roof can be either metal or water-proofed canvas. The driver is seated in the small cabin at the front, while the passengers sit on a bench over the two rear wheels. Tuk-tuks do not have meters and you must bargain with the driver and settle on the price before getting in. Foreigners must bargain harder with tuk-tuk drivers and be careful of drivers that take you to stores for you to shop at. Many times, the drivers get a kickback from the stores when you make a purchase. 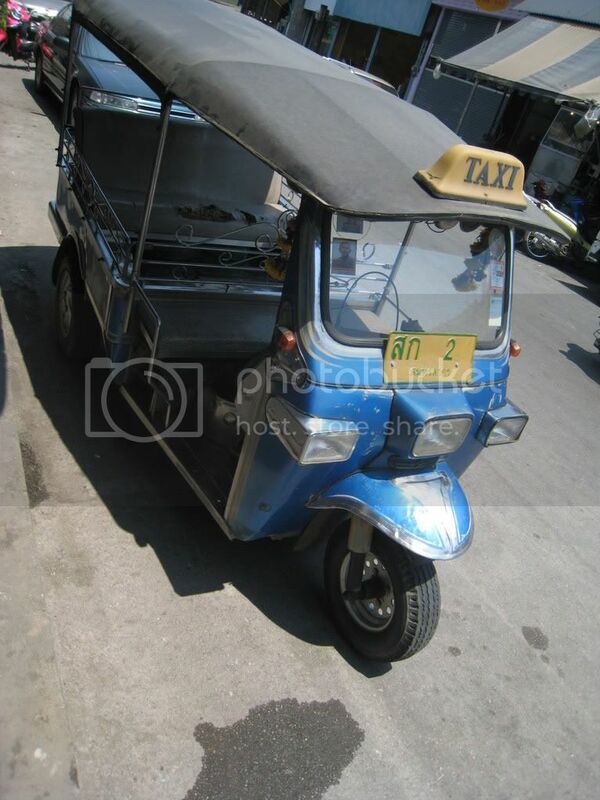 Tuk-tuks can be found in Bangkok around the Grand Palace, Hua Lampong and Khao San Road. In Chiang Mai, they are also found around the Night Bazaar. In the south, different versions of tuk-tuks are found in different towns. In Hat Yai, you’ll find a tuk-tuk that is a four-wheeled vehicle that resembles a small truck with two rows of benches in the back. It is essentially a “song thew,” but locals call it a tuk-tuk. Travellers to Thailand to make sure and take a ride in one of these special vehicles. Three passengers can fit in a tuk-tuk comfortably, although I have seen as many as six people squeezed into one tuk-tuk. I guarantee that a ride in a tuk-tuk will be a thrilling experience in your Thailand adventures. Within Thailand, there are four major dialects. The four primary dialects of Thai are not are not considered a different language. Rather, they are the regional form of Thai that is spoken by the locals, each with their distinctive pronunciations, phrases and words. All of the dialects are forms of the standard Thai language. These dialects correspond with the four major regions of the country: the southern, the northern (“Yuan”), northeastern (“Isaan”), and central regions. There are a few minor Thai dialects such as Phuan and Lue, spoken by small populations. Official or Standard Thai is based on the idealized speech of the educated people of Bangkok and Central Plains. Northern Thai is spoken around Chiangmai and Chiangrai. Northesatern Thai is spoken to the east of Korat. Southern Thai is spoken south of Chumpon and to the Malaysian border. There are different types of Thai “language” used by Thais in different social circumstances. For example, certain words or patterns of speech are used only by Thai royalty – called the royal language. There are also languages used for religious figures, polite everyday interactions and gruff or crude communications. The younger, education populations of the Northern, Southern, and Northeastern regions are bi-dialectal since they receive schooling in Standard Thai. However, in their homes and communities they maintain their regional identities and the local dialects are kept alive. Standard Thai is the language that is used when speaking with non-locals and aids in the ability of the peoples from different regions to communicate with each other. The national and official language of Thailand is Thai. It is spoken by around twenty million residents of the Southeast Asian country. The spoken language is thought to have originated in the area around Vietnam and China. Thai is related to the languages spoken in eastern Myanmar, northern Vietnam, Yunnan and Laos. Thai is a tonal language in the Tai group and the Tai-Kadai language family. Today, standard Thai is spoken nationwide with regional dialects differing widely from north to south and east to west, including Issan (Northeastern Thai), Passa Neua or Lanna (Northern Thai) and Thai Tai or Pak Thai (Southern Thai). Early Thai settlers in the late Dvaravati period gradually enlarged their Chinese-influenced, tonal, monosyllabic language by borrowing certain Mon and Khmer words. Later, the language absorbed polysyllabic Sanskrit (the classical language of Hindu India) and Pali words as Brahmanism and Theraveda Buddhism were infused. Foreign traders and Chinese immigrants made minor additions in later centuries. Thai as a written language was introduced by King Ramkamhaeng in the Sukothai period. The writing system has undergone very few modifications since this time. Writings from the Sukothai period can be read because it retains many similarities to modern Thai writings. The writing was based on Pali, Sanskrit and Indian concepts, and many Mon and Khmer words entered the Thai languages as well. King Ramkamhaeng created the first Thai alphabet in 1283. The Thai alphabet uses forty-four consonant and fifteen basic vowel characters. These are horizontally placed, left to right, with no intervening space, to form syllables, words and sentences. Vowels are written above, below, before, or after the consonant they modify, although the consonant always sounds first when the syllables is spoken. The vowel characters (and a few consonants) can be combined in various ways to produce numerous compound vowels (dipthongs and tripthongs). After 12 years at the top of the list, Bill Gates has been dethroned as the World Wealthiest Man by fellow American billionaire, Warren Buffet. Only four of the list released by Forbes Top 20 are Americans. The total net worth of the people of the list is $4.4 trillion and includes the fortunes of 226 newcomers. The youngest of the list is Mark Zuckerberg, 23, who is the founder of facebook.